In Search of Easter Gifts that Go Beyond the Chocolate Bunny? Spring has sprung – the bluebonnets have begun to bloom and Peter Cottontail is well on his way down the bunny trail. And if you’re like many parents looking to pass along the true meaning of this season to your little ones, you might find yourself having some trouble finding thoughtful Easter gifts. Sure, marshmallow chicks and chocolate rabbits are fun, but they don’t do much in terms of teaching about the resurrection story. As moms, aunts and grandmothers, we ladies at Magpies understand the challenge. One of our newest products at the shop — and one of the things we’re most excited about — is The Easter Story Egg. Created by the same company that produces The Christmas Star from Afar, The Easter Story Egg brings Holy Week to life with help from gorgeous hand-carved nesting eggs. The Easter Story Egg begins Palm Sunday, when you gather the family together to read the first portion of the included book. The passage discusses Jesus’ journey into Jerusalem, while the accompanying egg, the largest of the bunch, features a beautiful hand-painted palm. The story progresses from there, with day two focusing on the house of prayer, day three on love, and so on. Finally, on Easter Sunday, they open the smallest grey egg, which is empty, symbolizing the empty tomb and Jesus’ resurrection. We love this meaningful activity set because it fosters conversation about a subject that can be difficult for children to grasp. Not only that, but it’s interactive. So, while they’re having fun and enjoying story time, they’re likely learning something too. 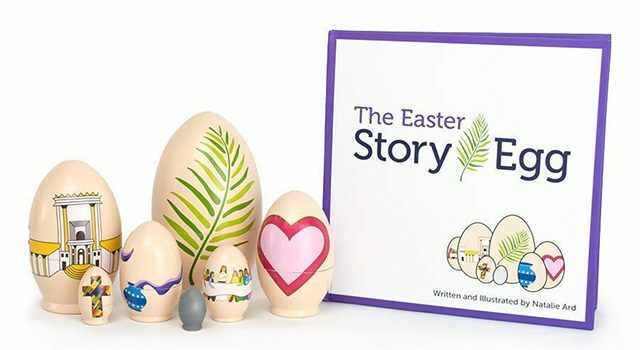 We hope the Easter Story Egg blesses your family by becoming an annual tradition and helping your little ones understand the true meaning of the resurrection.